Clintondale High School outside of Detroit, Michigan, has it tough. Its students are mostly low-income. Many travel an hour or more from Detroit. Over 70 percent receive free or reduced-price lunches. As a school of choice, Clintondale receives students from all over the district whose local school is not working for them. In 2010, around half of the ninth-graders failed science, math and English. Discipline was a major problem. Clintondale was ranked in the bottom 5 percent among Michigan schools. Principal Greg Green had been helping his son’s team by posting videos about baseball techniques on YouTube. He and social studies teacher Andy Scheel came up with an idea. They decided to teach one social studies class using a flipped method and one in a traditional manner. The flipped class contains many students who had already failed the class. After 20 weeks, no student in the flipped class had less than a C+. The traditional classroom was failing in the normal manner. The next year, Green flipped every class in the ninth grade. Going high tech at a poor school with no additional resources is not easy, but help exists. Green received a grant from TechSmith, a local company that creates lecture and screen recording software. Using Camtasia Relay, they posted lectures to the school website and YouTube. They extended the hours on the computer lab so students without their own devices or internet access could view the material. They use WACOM tablets and displays to bring presentations to life. They began with the freshmen class, but soon spread the techniques throughout the entire school. The results were astounding. Failure rates in each core subject were down 20 to 33 percent. The discipline rate dropped 66 percent. Green claims to have quadrupled the amount of time teachers spend with their students by turning them into guides rather than lecturers. At home, students work together via Google Groups. Clintondale teachers feel five to six minute lectures are the sweet spot for delivering information while keeping students engaged. Wishing they could be present when students were studying at home, they realized they needed to spend more time helping them with homework. They use an 80/20 rule for class. They spend 80 percent of their time working individually with students and only 20 percent of their time delivering material in class. The ratio used to be reversed or even more lopsided. Successful flipping requires teachers across the globe pulling together. Otherwise, it would be impossible for one faculty to create the material. Furthermore, flipping is a developing art. Lessons learned from trial and error must be shared from school to school in order to perfect technique. Clintondale uses teacher-generated videos plus content from primarily the Khan Academy and TED. They collaborate with other flipped schools across the country. Calculus students learn from a private school in Virginia. Other students learn about the Holocaust from a teacher in Israel who took her class to Auschwitz. The Clintondale learning network continues to expand. 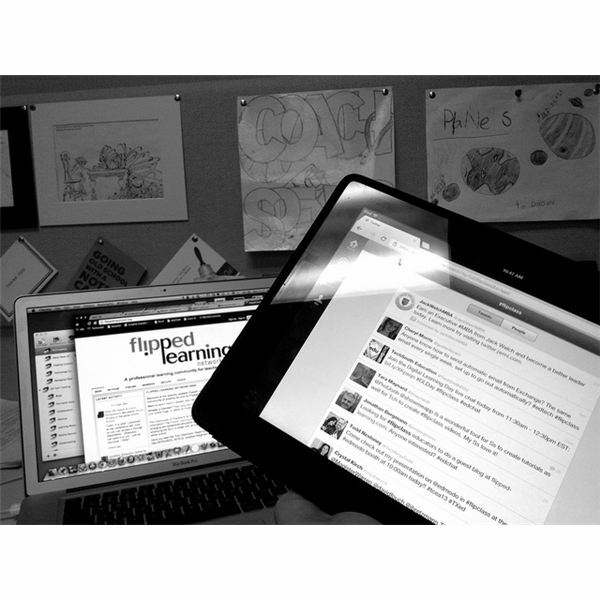 Delivering virtual material to low-income students is one of Flipping’s principal obstacles. Clintondale uses creativity to overcome this hurdle. For students with computers but no internet, lectures are placed on thumb drives. For those with DVD but no computer, DVDs are burned. Lessons are loaded onto smart phones. The extended computer lab hours create a place for students to work together. The success of flipping at Clintondale has spread outside of its community. The Clintondale Virtual School specializes in credit recovery. If a student fails or misses a class, he or she can take it online to make up the credit. Other credit recovery schools average a 50 percent success rate. Clintondale passes students at an 89 percent rate. CVS differs from other virtual education sources because of its coaching. The school delivers personal tutors who make weekly contact with parents or guardians. They realize students in need of make-up credit are often discouraged and need a shift of perspective. In addition, since the school draws from around the world, students can be vastly different in needs and background. CVS takes an inquisitive path to finding the right way for a student to succeed. Clintondale has become one of Flipping’s flagship examples. In only a couple of years, the school went from a disheartening failure to something Principal Greg Green can be proud of. Discipline has improved. Failure is down. Graduation is up. College readiness has increased. Measuring long-term success is difficult over such a short period of Flipping. The Class of 2012, although only part of the flipped model for six months, increased the graduation rate from 80 percent to 90 percent and college attendance from 73 percent to 80 percent. The school has become a willing example for anyone wishing to flip their institution into something more successful.